Classic Turf is the result of modern chemistry and creative engineering, and it is the ultimate all weather cushioned tennis court surface. Also known as the "Softest hard court to ever play on", the surfaces biomechanically engineered 3/8" solid rubber produces a soft and comfortable surface, reducing fatigue and excessive impact on back, legs, knees, ankles, feet and joints. 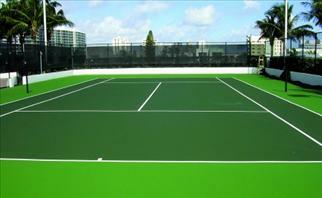 Classic Turf surfaces can be installed over a variety of surfaces such as, asphalt, concrete, wood, etc.. The waterproof, elastic and flexible properties absord expansion and contraction of the subsurface. With a 5 year to Life warranty under Classic Turf's maintenance guidelines, you are sure to have an enjoyable surface to play on.